Roberta Martin is to today’s enthusiasts of gospel music what writers like James Joyce and Henry James are to today’s enthusiasts of literature: someone whose work is considered the gold standard, but few take the time to explore the wonderment of their artistic creations. Fremeaux & Associes in France has made it easier to indulge in the work of Roberta Martin and her Roberta Martin Singers. Offering 72 tracks and a 24-page booklet with illustrations and recording details, the new three-CD set called Roberta Martin Singers: 1947-1962 contains more than three hours of music covering most of the group’s recording era. One of the first, and certainly the most influential, African American mixed-voice gospel ensembles, the Roberta Martin Singers emerged in 1933 out of the Young People’s Chorus of Chicago’s Ebenezer Baptist Church. Martin, a transplanted Arkansan with classical music training, was brought on as gospel chorus accompanist at Ebenezer in 1932 after Thomas A. Dorsey was spirited away by Pilgrim Baptist Church to organize its own gospel chorus. With a fond affection for children, Martin divided her time between the adult gospel chorus and the church’s Young People’s Chorus. In 1933, inspired by Bertha Wise and the Wise Singers, an East Coast ensemble, Martin selected a few male singers from the Young People’s Chorus and a couple of youth soloists from nearby churches to form a smaller troupe called the Martin and Frye Quartette. Changing its name to the Roberta Martin Singers in 1936, the group made the rounds of religious music programs and other city-wide events, introducing to each audience some of Roberta’s newly-composed gospel songs and contemporary arrangements of classic hymns. By 1945, Martin was recording copies of the ensemble’s most popular songs on her own Roberta Martin Studio of Music label. Two years later, the Roberta Martin Singers signed with Apollo Records of New York, label home of the great Mahalia Jackson. By the end of the 1940s, the Martins were second only to Jackson in terms of sales for Apollo’s religious division. They were booked solid nine months of each year, traveling coast to coast. 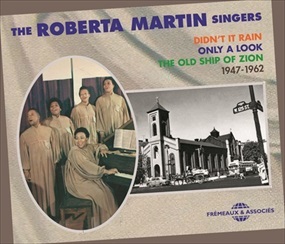 Roberta Martin Singers: 1947-1962 opens with some of the group’s earliest independent pressings, most of which were soon reissued on the Detroit-based Religious Recordings label, then by Specialty Records on its short-lived Fidelity imprint. Two tracks from this era, both featured on Disc One, are exclusive to this collection. “No, No, Nothing Can Change Me” and “Oh, Say So” were not reissued by anyone after they made their debut on Miss Martin’s indie label. They were only discovered after this author found the disc while digging through a crate of 78 rpm records in a Chicago record store a few years ago (“Oh Say So,” led by DeLois Barrett Campbell, can also be heard on Disc Two under its Apollo release title: “Have You Found a Friend”). In many respects, Disc One is a hit parade of gospel songs popular in the late 1940s and early 1950s. For example, “The Old Ship of Zion,” “Satisfied,” and “Do You Know Him” were covered by many gospel soloists, groups, quartets, and choirs. The Religious Recordings version of “Yield Not to Temptation” is taken at a quicker tempo than the later, better known, Apollo release, though both feature DeLois Barrett Campbell as soloist. I would argue that the earlier is the better of the two. 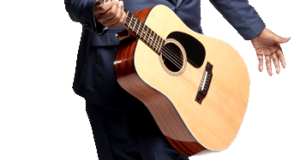 Not all Martin songs moved with Baptist solemnity. Selections such as “He Didn’t Mind Dying” and the Roberta-led “Sinner Man” demonstrated that the Martin Singers could certainly swing in the spirit. 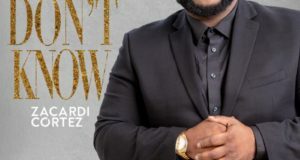 Nevertheless, hearing one cut after another on these CDs provides ample evidence of how capably the singers employed vocal dynamics to keep their listeners engaged at all times—and that their quality never wavered over the years. Discs Two and Three investigate the Martins single and album-only work for Apollo and Savoy Records. Their first two years with Savoy, 1957 to 1959, represent the group’s golden era. During this time, they blessed audiences, airwaves, and phonographs with such classics as “Grace,” “God is Still on the Throne,” and “God Specializes” (all contained in the collection). Eugene Smith’s house wrecking voice (see especially “Since He Lightened My Heavy Load”) and Norsalus McKissick’s burnished baritone are on full display here. To give props to Robert Anderson, a charter member of the Martins who went off on his own early in the group’s recording career, the collection includes two 1954 tracks by the Robert Anderson Singers. They recorded for Apollo with Miss Martin on piano and Martin alumnus Willie Webb on organ. Together, they give the woefully underappreciated “Since My Heart’s Been Changed” the motive force of a quartet at full throttle. The collection does not contain any of the group’s recorded output after 1962, a seven-year period that witnessed their first and only live recording (1963) and “God’s Amazing Grace,” a longstanding piece in their repertory but inexplicably not committed to vinyl until near Martin’s passing in January 1969 at age 61. Surface noise is audible on some of the earliest cuts because recordings, not original tapes, were all that was available for mastering. The audio improves as the quality of the source material improves. And if you are wondering, “There’s Not a Friend Like Jesus,” the sole example of short-term Martin Singer Sadie Durrah’s lead work, is not included. Although the side is listed in Hayes and Laughton’s Gospel Discography as on Fidelity 2003, it may never have been issued, or in such small quantities as to be as rare as a Paramount country blues. Nobody I know has ever seen a copy—neither on Fidelity or the Roberta Martin Studio of Music imprint—but then again, nobody had seen a copy of “Oh Say So” until it turned up on Chicago’s south side, sandwiched between R&B 78s. So hope springs eternal that a plastic dairy crate or musty box somewhere in the U.S. contains a well-loved 78 of this elusive gospel disc. Jean Buzelin’s well-crafted and extensive liner notes are written in French, though Martin Davies translates an English summary of the notes for those of us not fluent in French. The booklet also includes a helpful listing of the recordings with known session dates, personnel, and original labels. The singing on the 72 selections washes over the soul like a warm ocean wave, leaving only the stillness of peace in its wake. It’s the project Roberta Martin has deserved for decades. Thanks be to Patrick Fremeaux, Jean Buzelin, and the rest of their team for birthing it into existence. 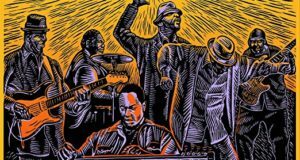 It’s as essential to gospel music fans as the Sun Box is to aficionados of American popular music.